Who was excellent until the sword. Where were you transported, having been beheaded, Pudens? Where was he transported, to whom is directed incorruptible praise? Which he approaches through the sharp sword. On the fourteenth the disciples were carried away. 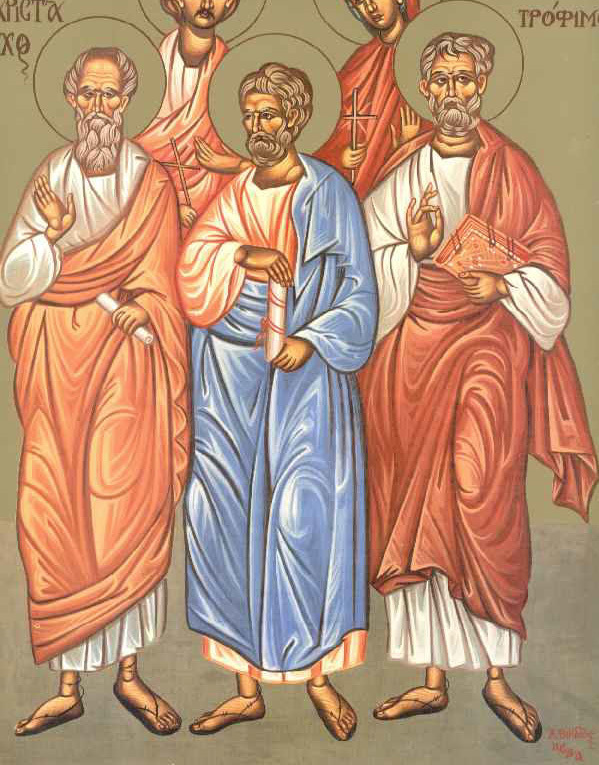 These three were numbered among the Seventy Apostles, followers of the Apostle Paul, who preached the gospel of Christ, and suffered with their teacher Paul in persecutions and trials and temptations. During Emperor Nero's persecution, when the Apostle Paul was beheaded, all three of these glorious apostles were also beheaded, according to Latin sources discovered by Dorotheos of Tyre in Rome. The Apostle Paul mentions Aristarchus several times. He was one of those faithful companions of the apostle Paul who shared with him his labors and sufferings. He is suddenly mentioned along with Gaius as having been seized by the excited Ephesians during the riot stirred up by the silversmiths (Acts 19:29). 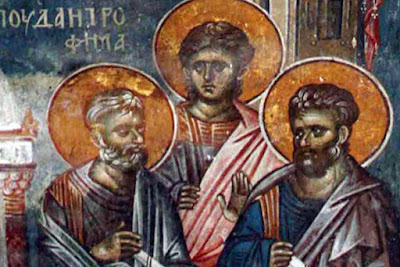 They are designated "men of Macedonia, Paul's companions in travel." We learn later that he was a native of Thessalonica (Acts 20:4; Acts 27:2). They were probably seized to extract from them information about their leader Paul, but when they could tell nothing, and since they were Greeks, nothing further was done to them. When Aristarchus attached himself to Paul we do not know, but he seems ever after the Ephesian uproar to have remained in Paul's company. He was one of those who accompanied Paul from Greece via Macedonia (Acts 20:4). Having preceded Paul to Troas, where they waited for him, they traveled with him to Palestine. He is next mentioned as accompanying Paul to Rome (Acts 27:2). There he attended Paul and shared his imprisonment. He is mentioned in two of the letters of the Roman captivity, in the Epistle to the Church at Colossians 4:10, and in the Epistle to Philemon (Philemon 1:24), in both of which he sends greetings. In the former Paul calls him "my fellow-prisoner." 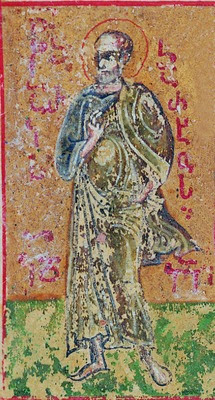 According to tradition, Aristarchus was martyred by beheading during the persecution of Nero. 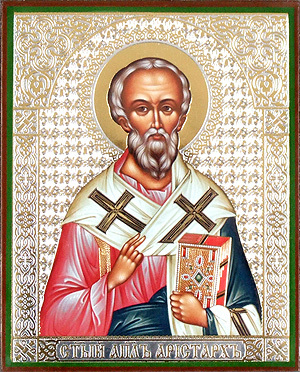 Dorotheos, Bishop of Tyre, distinguishes him from another Apostle Aristarchus, who was bishop of Syrian Apamea, but they are probably the same person. He is also celebrated on September 27th. Pudens was a distinguished citizen of Rome. 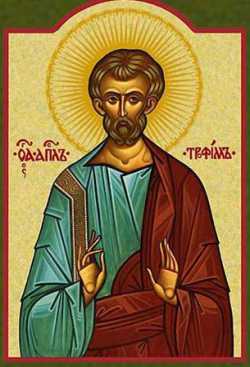 The Apostle Paul mentions him once: "Eubulus, Pudens, Linus, Claudia and all the brothers send greetings" (2 Timothy 4:21). At first, the home of Pudens was a haven for the Foremost Apostles Peter and Paul and later it was converted into a place of worship, called the Shepherd's Church, which can still be seen in Rome. Pudens was one of the Christians in Rome who remained loyal to Paul during his second and last imprisonment there, when most of the Church "forsook him." Writing the last of all his letters, the Second Epistle to Timothy, Paul sends greeting from "all the brethren" who were then with him. Among these he names Pudens. According to tradition, Pudens was martyred by beheading during the persecution of Nero. Trophimus was a disciple of Paul, a Gentile and an Ephesian by birth, who came to Corinth with the apostle, and accompanied him in his whole journey to Jerusalem in 58 A.D.: ""Sopater, the son of Pyrrhus, from Beroea, accompanied him, as did Aristarchus and Secundus from Thessalonica, Gaius from Derbe, Timothy and Tychicus and Trophimus from Asia" (Acts 20:4). 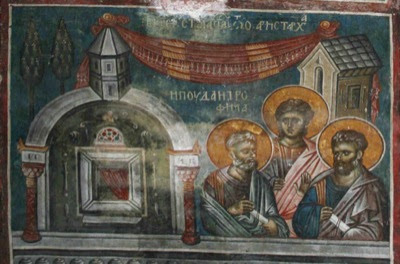 When the apostle was in the temple of Jerusalem, the Jews laid hold of him, crying out: "He has brought Greeks into the temple, and has polluted this holy place;" because, having seen him in the city accompanied by Trophimus, they imagined that he had brought him into the temple. Some years afterwards, Paul writes that he had left Trophimus sick at Miletus: "I left Trophimus sick at Miletus" (2 Timothy 4:20). This did not occur at Paul's former visit to Miletus, since Trophimus went with him to Jerusalem; nor on the voyage to Rome, for they did not go near Miletus. It is therefore one of the circumstances which prove that Paul was released, and revisited Asia Minor, Crete, Macedonia, and perhaps Spain, before his second imprisonment and death. Of Trophimus nothing farther is known, though according to tradition, Trophimus was martyred by beheading during the persecution of Nero. 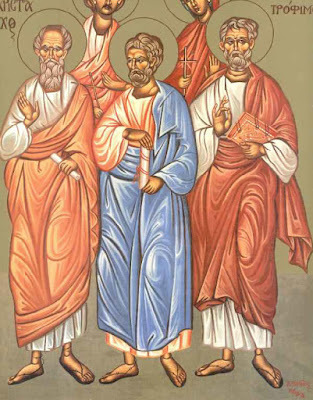 Together let us honour the threefold choir of Christ's Apostles, as rational rivers, Aristarchos, Pudens and Trophimus. With the divine words of the knowledge of God, they watered the world. By their entreaties O Christ our God, have compassion on us all. Apostles of Christ, the Saviour's labourers, you are the light of the world. Intercede for us who praise your glorious memory, and pray that we may be saved.